It’s always great when you can re-purpose ingredients for a new dish. Today for a lunch appetizer, I used the leftover ricotta filling and pesto sauce from the tortellini I made for Terry. Both ingredients freeze well, just take them out the day before you want to use them to let them thaw. Let the pesto thaw in the fridge and then take it out several hours before you need it so it comes up to room temperature. Just get some fresh mushroom caps (any variety will do, I used white button and baby portabella would be great, too). Stuff with the cheese, top with the pesto and voila! Easy appetizer. Pop them in the oven for 12-14 minutes and serve. Those look so yummy! And easy to make. Maybe I’ll give them a whirl the next time I want to impress folks with fancy apps. 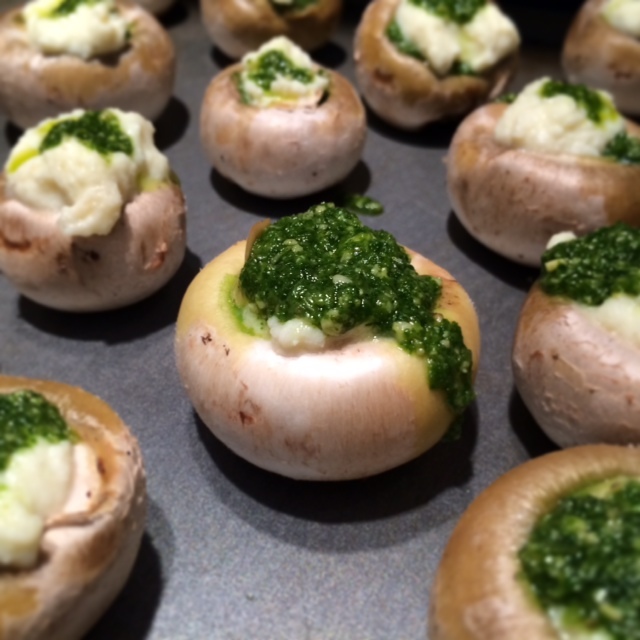 You can do an even easier version with pesto and mozzarella from the deli – pop em in the microwave for a few minutes. They’re just as tasty and take less time!